Where’s Mark? St. John is there. Bailey annoyed! | "MASTERS"
Where’s Mark? St. John is there. Bailey annoyed! Posted on January 10, 2016 by Mark and Sarah - MASTERS! MARK ST. JOHN BAILEY: “George, George! !” No, not the start of a Famous Five Book, instead an urgent call for Georgina Barnard, wife of Shane (Sarah’s brother) and full time nurse. I was in the back of Shanes’ Mazda SUV, George next to me. We were waiting for the rest of the family, all excited like kids as we were heading off to the Barossa Valley for a wine tasting adventure to celebrate Shane’s birthday. But the tone of Shane’s voice immediately caused alarm. Something had happened in the two minutes since we’d left Sarah and her parents upstairs. Georgina ran from the car as if she’d just received a “crash call” at work. All sorts of things went through my head as I followed, none of them good. As I opened the front door, my worst fears were temporarily realised. There was Gwen, Sarah’s 84 year old mother, lying at the foot of the stairs being told “not to move” by George and Sarah. It didn’t look good. But Gwen was conscious and whilst clearly in pain and shock, was talking lucidly. It transpired that she had somehow “pirouetted” and then fallen half way down the stairs, head first, backwards. Sarah heard her mother slip and saw it all! Remarkably, Gwen was just badly bruised and after a few minutes sat up and announced that she was ready for the Wine Tour! 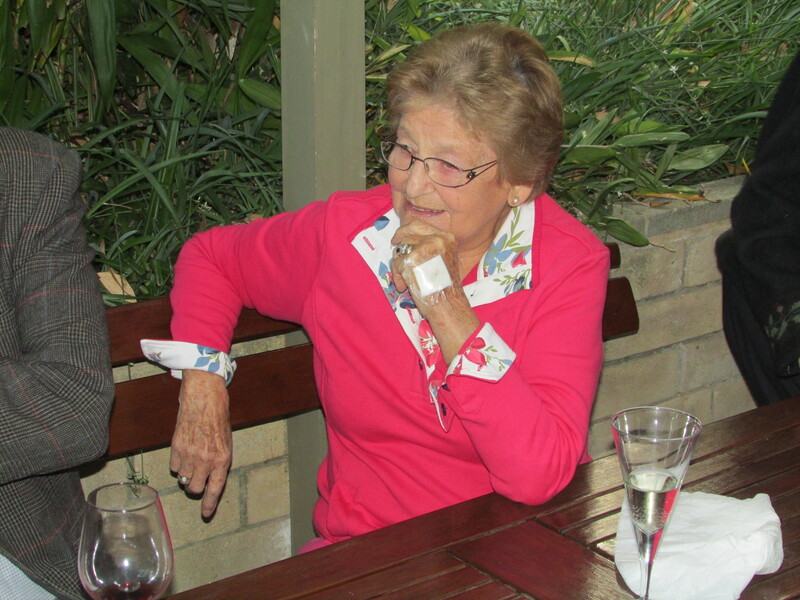 She’s tough as old boots my Mother-in-Law. George proceeded to closely monitor Gwen, but amazingly she was ok and subsequently had a few wines to celebrate the positive outcome to what could have been a completely different scenario. We had a great Christmas with Shane and George, their three children (see earlier Eddie Blog) and Gwen & Dennis. The only downside really was having to eat our Christmas dinner indoors as the temperature outdoors was close to 40C and simply too hot. So yes, we did BBQ the turkey, but brought it inside to enjoy, in air conditioned comfort. 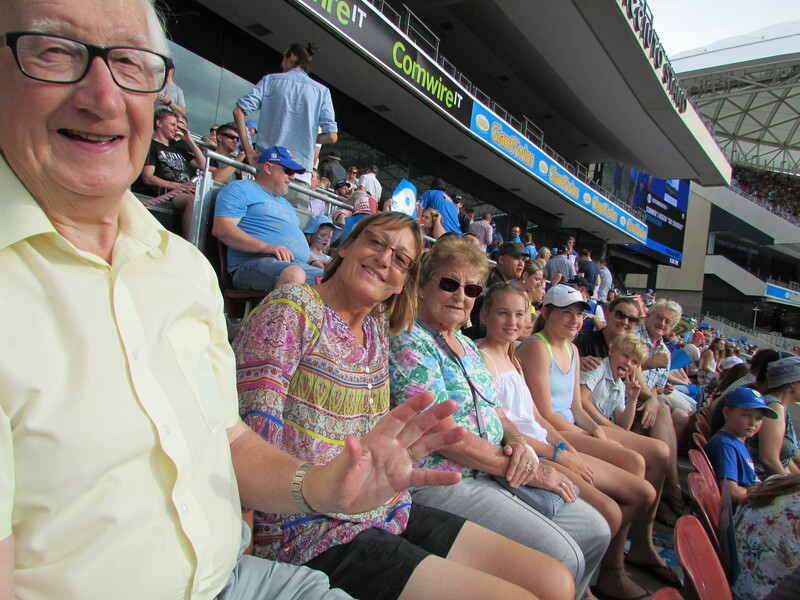 Highlight of the trip for us was the fantastic night at the Adelaide Oval watching the Big Bash cricket followed by a spectacular New Year’s Eve show with fireworks brightening the sky as the evening came to a close. The 4th January 2016 soon came round. One of those dates historically I would have been dreading in the UK as it would have signalled a return to work. Not this year. 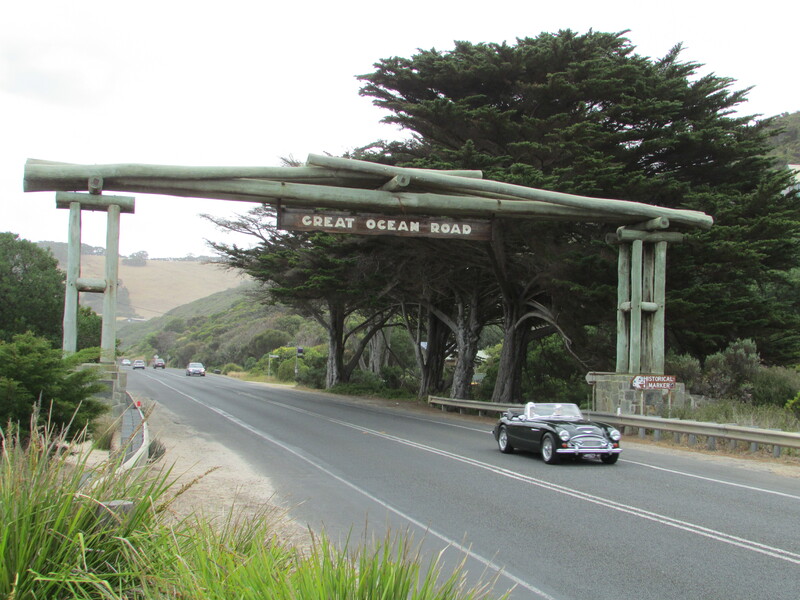 Instead, the 4th Jan heralded our departure from Crafers, near Adelaide (Shane’s House) and a journey that day of 425 miles along the Great Ocean Road (GOR). 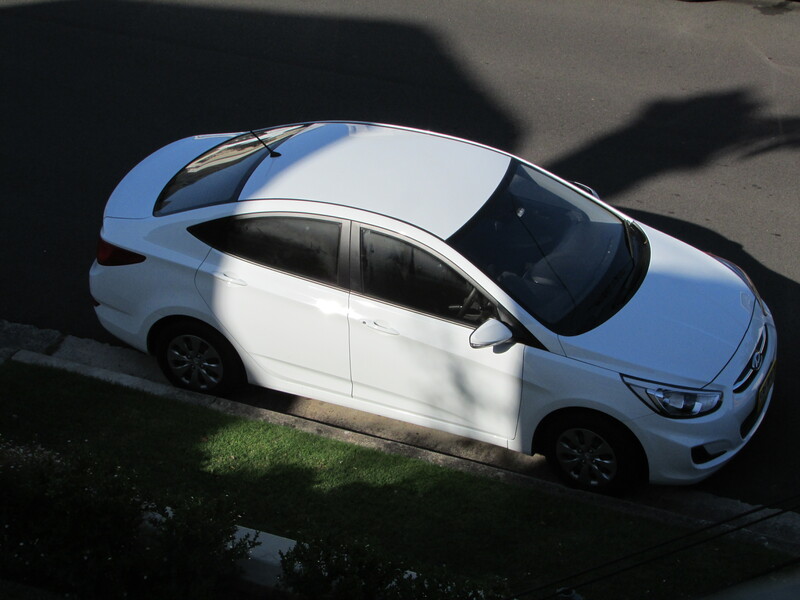 New hire car ready – the first went back after the clutch failed on the freeway – I was now the excited driver of a Hyundai Accent, with 3,000kms on the clock! But could I remember how to drive after four months? Fortunately the answer was yes as we headed over the Murray River at a steady 110 kph (68 mph). 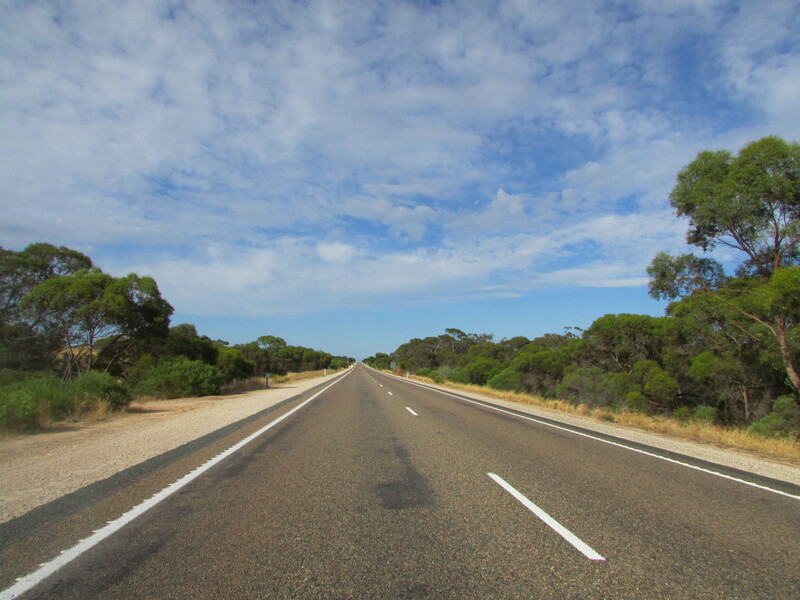 The GOR is often thought of as the entire main road from Adelaide to Melbourne, a distance of some 595 miles. 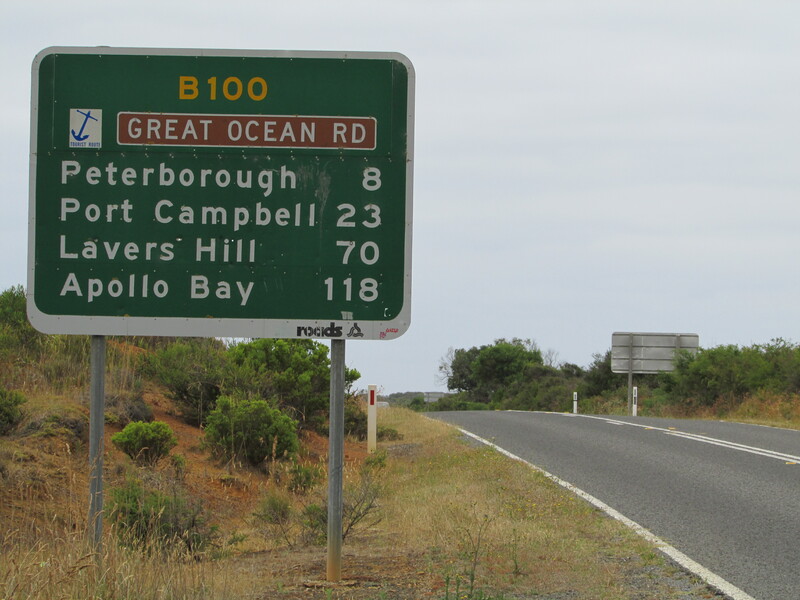 The reality is that the true “Ocean Road” bit is only 160 miles from Allansford to Torquay. Day 1 was good, if not spectacular. Mile after mile of empty single carriage-way road. 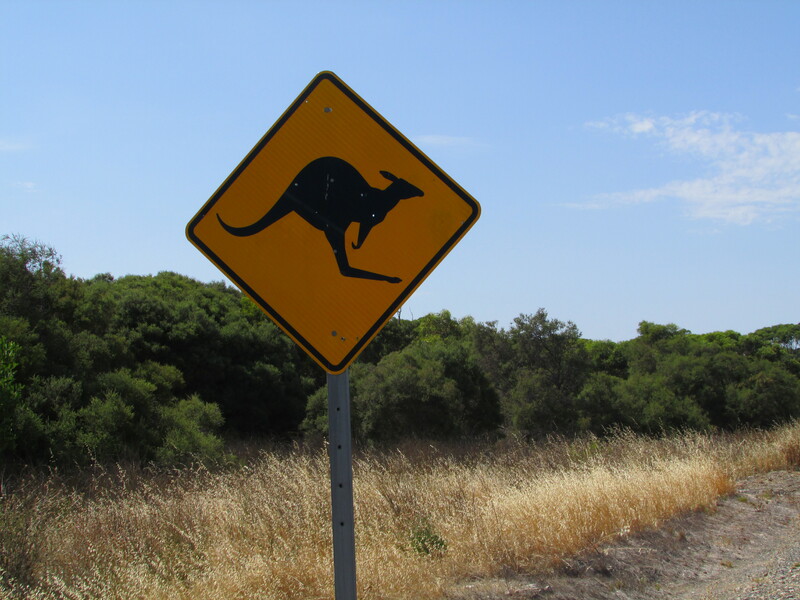 The main activity for the first couple of hundred miles was counting the number of dead kangaroos that seemed to litter the highway. 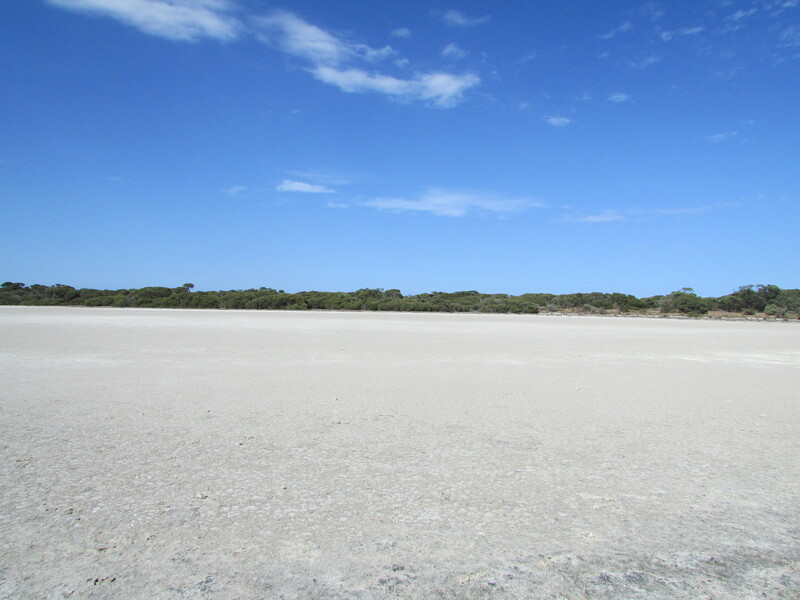 I got up to 12 as the monotonous landscape of scorched brown bush gave way to salt flats which shone in the distance like a desert mirage effect. Why don’t they read the signs! Nelson, and the State border with Victoria came and went. 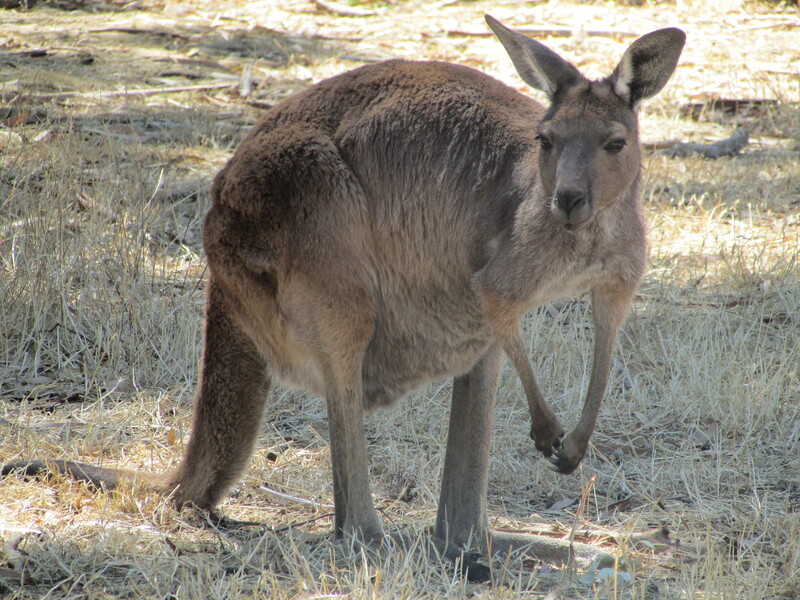 Bye bye South Australia, clocks forward 30 minutes – random. Then as we approached the picture postcard Port Fairey, the landscape began to change. 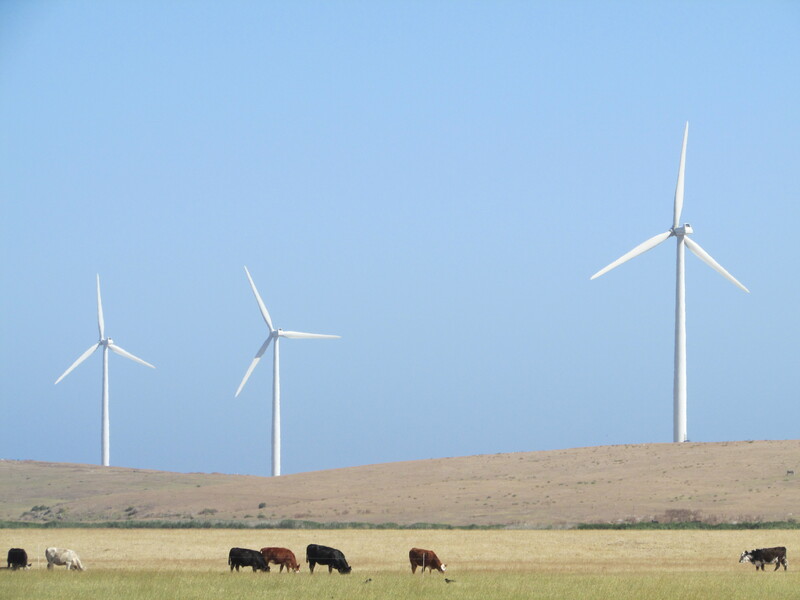 Wind turbines as far as the eye could see, along the Limestone cliff top. Love them or hate them, aesthetically you couldn’t help but marvel at the sight, their tall white blades contrasting beautifully with the blue sea and sky backdrop of the great Southern Ocean. Next stop, Antarctica. Windy Miller on the right – can you see him? Our overnight $110 Motel in Warrnambol was fine; clean and tidy, a good shower and a good bed. They got the basics right and even had some catering facilities enabling us to visit the local Woolworth’s (an Aussie TESCO) and raid the discounted chiller cabinets for “goodies” that were about to hit their “sell by date”. If you look after the pennies the pounds will look after themselves, tha knows! Next morning semi refreshed we were off by 0730. Today was the day, driving the GOR proper. There was even a sign for Peterborough which made us feel at home. John Hodson, one for you. BUT the ABC National news bulletin at 0800 soon confirmed our worst fears on the crackly AM radio. 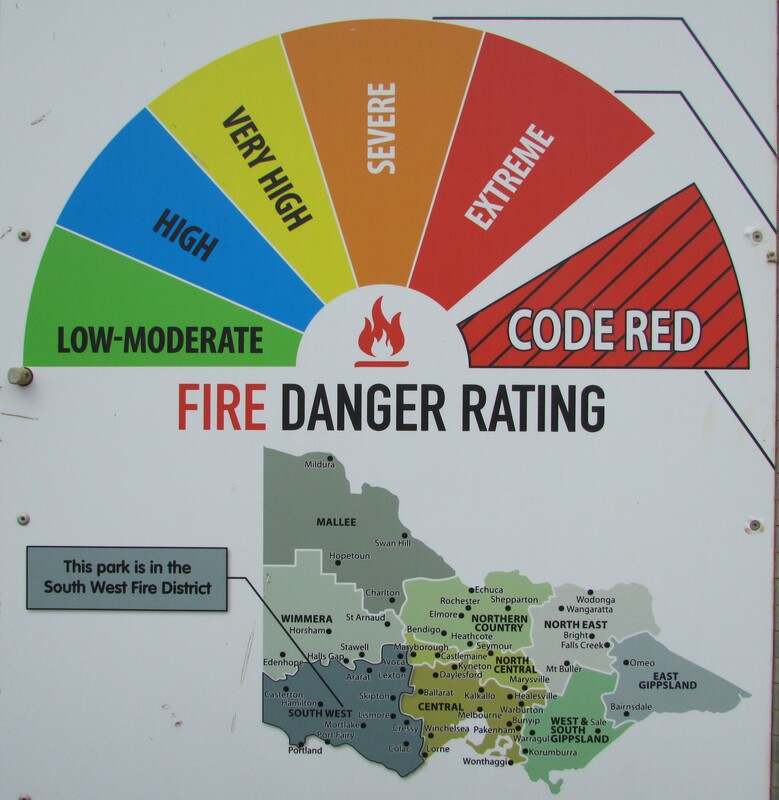 Part of the route, the 30 mile stretch from Kennett River to Lorne was still closed because of a raging bush fire that had destroyed 116 coastal homes over the Christmas period. Big “shout out” at this point to Shane Barnard and my friend of 44 years, Ian Marr, two part time firemen who regularly put their lives on the line. Shane fought the Adelaide Bush Fires last year and Ian has ensured the safety of North Yorkshire folk for well over twenty years. Gentlemen – RESPECT. But despite the negative news, we weren’t going to be downhearted because the main road past the World famous Twelve Apostles was still very much open, and as always, we had a plan B. More of that later. 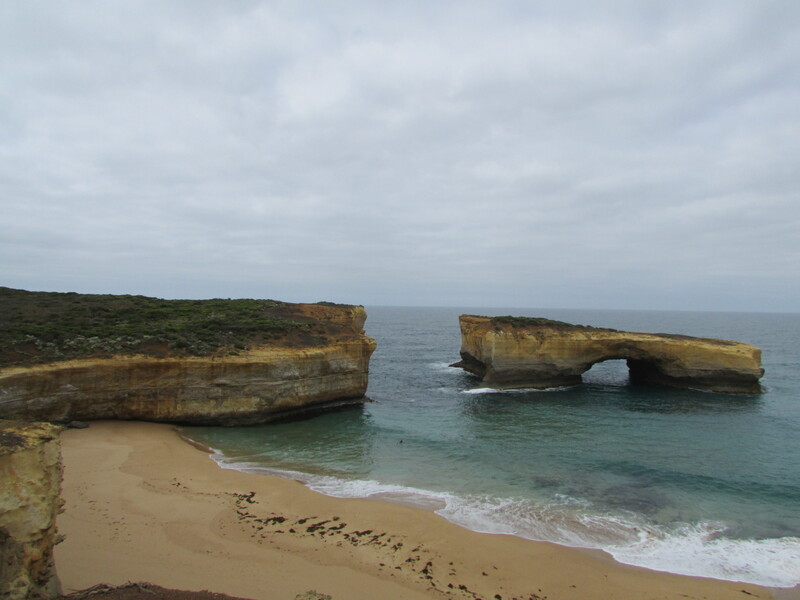 With just 250 miles to drive to Melbourne on Day 2, we had scheduled plenty of time to stop at a number of tourist vantage points including the Bay of Islands, Loch Ard and London Bridge before we arrived at the main event. And OMG – if you pardon the pun – what a sight the Apostles were! 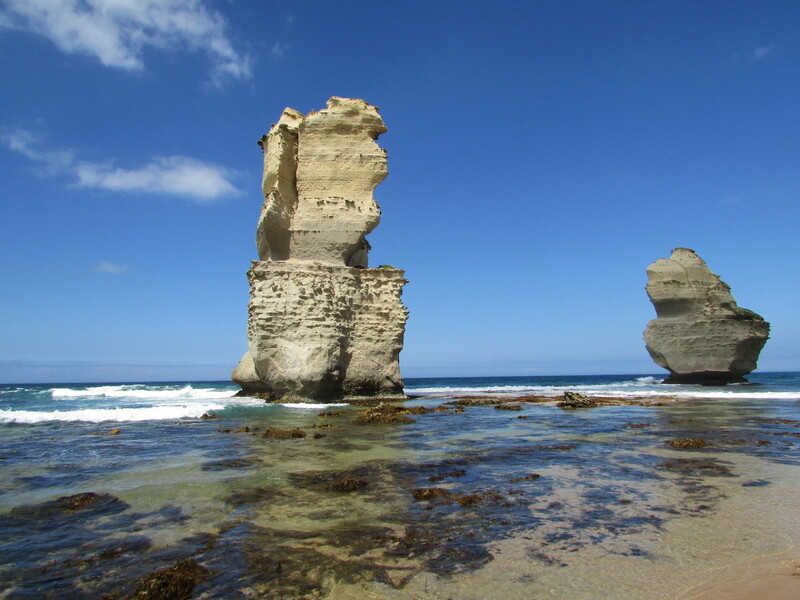 The Twelve Apostles – a collection of limestone stacks just off the shore of Port Campbell National Park. 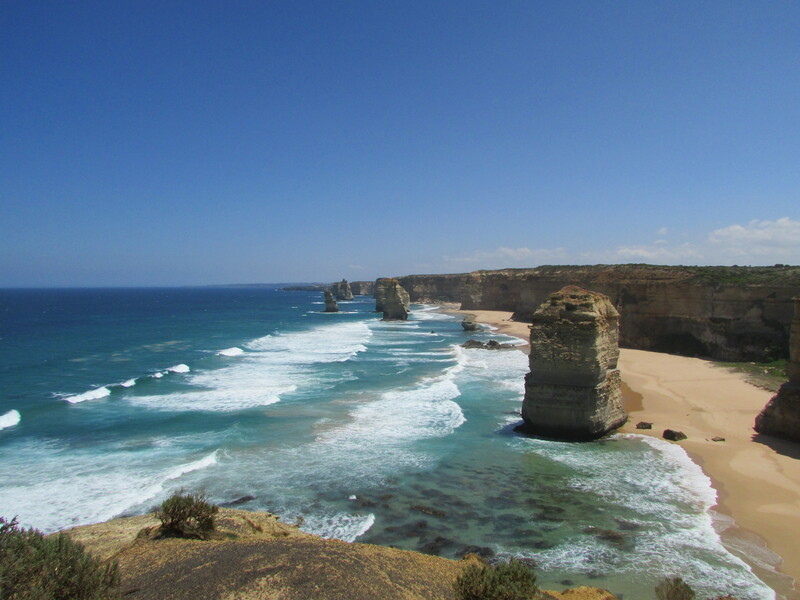 Twelve is a made up figure – wonder why – as currently there are only eight apostles left, the ninth collapsed in July 2005 after pounding waves won the coastal erosion war. No surprise there. From the beach, the ever changing light created photographic opportunity after photographic opportunity. 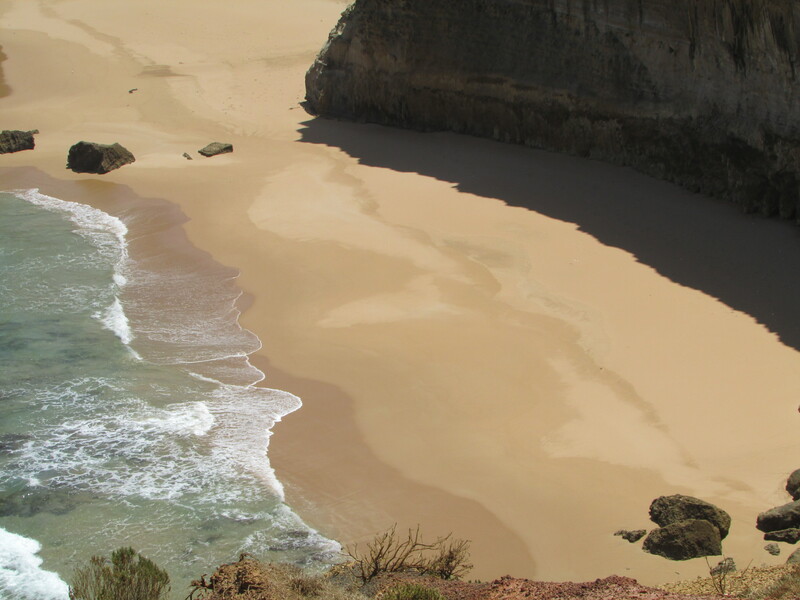 Beautiful white and yellow sand, contrasted with the crystal clear translucent water close to the shore only to be replaced with deep blues and turquoises 100 metres out. White foam broke over the stunning stacks. The Apostles may have been wet, but they stood proud, rising over 300 feet from the Ocean floor. It was one of those “Grand Canyon, wow moments”. Interestingly I always thought Mark was an apostle. Not true, I found when researching this blog. So the question I have is how come John and Matthew were apostles, but the remaining two authors of the Gospel – Mark and Luke – were not? Answers please on the back of a post card or sealed down envelope. 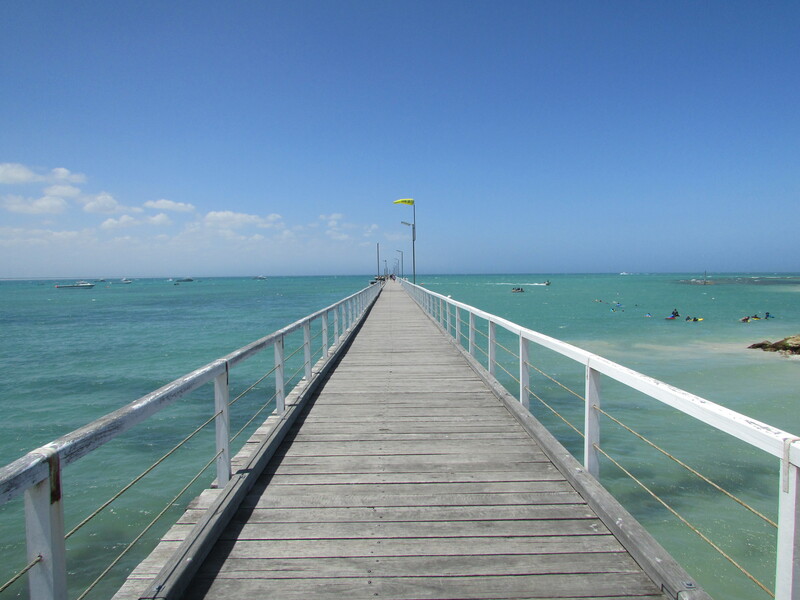 Anyway, we had an amazing time and three hours and a quite a few walking miles later, we were back in our white hire car and heading further along the coast, this time to Apollo Bay, with the aim of speaking to the Tourist Information Officer. The news was the same. The GOR just a few miles away was still shut – until tomorrow!! I said I’d come 12,000 miles to drive the route, but the lady was having none of it. 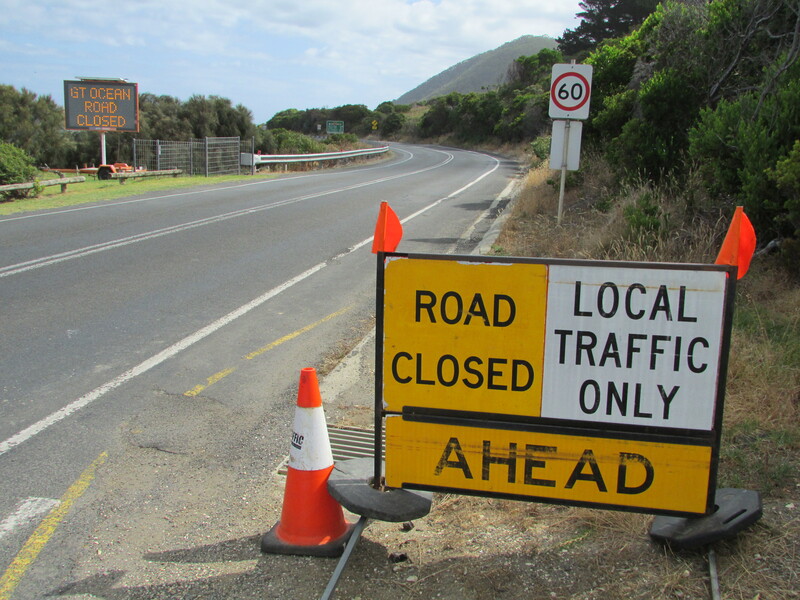 So Plan B was put in to immediate effect and there then followed a 75 mile detour inland through the Victoria Hills, dropping down in to Lorne enabling us to “miss out” the blackened, charred and smokey section of coastal road. And so our Coastal Adventure was nearly at an end. We sped past Torquay and hit the Freeway into the centre of Melbourne, with the Sat Nav lady finally earning her keep with good instructions albeit with strange strangled Aussie accent. THE GREAT OCEAN ROAD. Yes this is one of the great roads, along with the Pacific Coast Highway from Los Angeles to San Francisco and of course the World famous Buttertubs Pass in North Yorkshire. If you ever find yourself in this neck of the woods, do find time to drive it. And if you need putting up in Adelaide, did I tell you that I know a good Bed and Breakfast establishment, run by a bloke from Wiltshire? Mark and Luke were not one of the original followers (Twelve Apostles) of Christ but took up the role after Jesus’ death – they were quite a bit younger so had more energy to spread ‘The Message’- clever really!! Great pics as always and so glad to know that Sarah’s Mum is ok. Are you travelling the other side of Melbourne along the coast and the Napean Highway. This is where our friend John lives and with whom we spent a couple of days with after our hols in NZ. Sadly not Mary. We flew over the top from Mel to SYD because of time – may be next time. 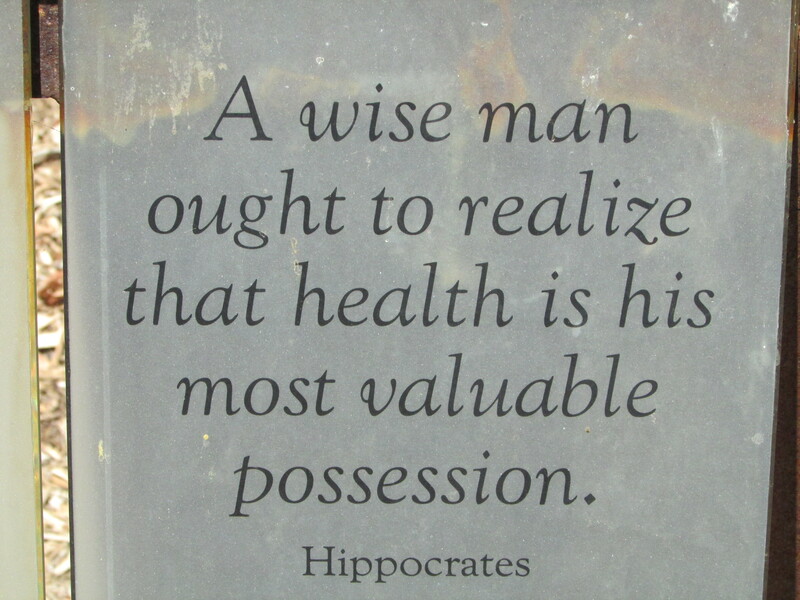 Sarah’s Mum has been diagnosed with broken/fractured ribs on her return to the UK and is in pain without the drugs…. Hello!!! Was starting to worry about you both! Glad your xmas was good and I hope Sarah’s mum is Ok. I think the last time I saw her was in 1981 when I made the trip to Wiltshire to stay with Sarah at the end of the Easter hols. It snowed so we couldn’t get back to Leeds on time. Mrs Barnard looks pretty much the same!!! Great pictures they have cheered me up after the return to work blues. Ah thank you David, my mind is now at rest. Ahmen. Happy NY to you and Barbara from SYD.